Each Rack's Dimensions:Glass Holder L 13" Wall bracket W 15"
Organizational: You can easily create more room on your counter, cabinets, bar cart, server, buffet, hutch, credenza and more. Either you can install both on the same space or utilize each one separately to maximize function. Easy Installation: Made of good craftsmanship, these 15" x 13" wrought iron stem racks come ready to use with the necessary hardware for easy installation, so mounting this on your empty wall space will be a breeze. 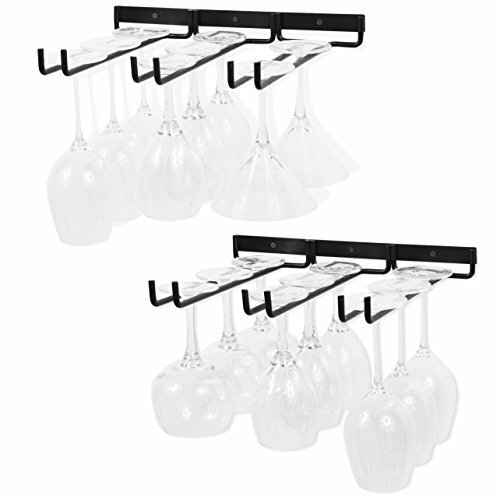 Sturdy Construction: Depending on the size of the glass, each rack can hold up to 3 to 4 wine glasses with ease. You can store 3 of your bulky, hard to store wine glasses with this mounted inside your cabinetry or wall, so your glasses are easy to reach and safely stored. Industrial Design : The 8.5mm wrought iron material is built to last you a lifetime with 100% satisfaction guaranteed. The quality of the sturdy iron material is durable and dependable, so keeping your stemware chip-free is no longer a hassle.